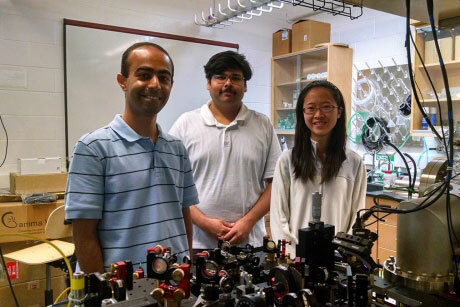 (Nanowerk News) These quantum-compatible mechanical resonators were conceived in the lab of Mukund Vengalattore, assistant professor of physics in the College of Arts and Sciences, who established Cornell's first ultracold atomic physics laboratory. The work, described in a recent Physical Review Letters paper ("Dissipation in Ultrahigh Quality Factor SiN Membrane Resonators"), was supported by the Army Research Office under the DARPA QuASAR (Quantum Assisted Sensing and Readout) program and the National Science Foundation INSPIRE program, which rewards high-risk, high-reward collaborations. Mukund Vengalattore, left, Yogesh Patil and Laura Chang '15 in the Ultracold Atomic Physics Lab in Clark Hall, where they conducted their experiments. Sensors made out of mechanical resonators are commonplace devices in electronics. For example, they are used in mobile phones as accelerometers, gyroscopes and signal filters. Due to their sensitivity to miniscule forces, they are also increasingly used in materials studies and nanoscale imaging. But their performance is limited by their rapid loss of energy to the environment in the form of random, uncontrolled vibrations - a phenomenon called thermomechanical noise. Minimizing this energy loss is key to more accurate mechanical sensor technologies. Using insights from atomic physics, Vengalattore's group has developed methods to control this energy loss, thus creating the world's most accurate mechanical resonators, capable of detecting temperature changes as small as a millionth of a degree. Their prototype resonator is a small silicon nitride drumhead, from which vibrations can be regarded as localized sound waves or “tones.” In their PRL paper, they use one tone of this drum to manipulate another, akin to how physicists use light to manipulate light in the field of quantum optics. Using the principle of nonlinear control, they have suppressed the random vibrations and demonstrated the classical physics analog of the mysterious quantum phenomenon of entanglement. For the experiments, the researchers developed precision techniques that can be extended to the quantum regime, opening doors to studying quantum acoustics. What does this mean for sensor technology? Potentially, it's revolutionary. A room-temperature resonator sensitive to quantum forces could, for example, form the basis for such technologies as inertial navigation systems, which use gyroscopes and accelerometers instead of satellites. It could also be used to detect the motion of individual electrons in exotic materials, with applications in solar cell technologies, among other things. “We're exploring ways to build sensors and sensor technologies that make use of quantum mechanics to get higher levels of precision than what's been available before,” Vengalattore said. While ultracold atoms are great for precision measurements, they are fragile and thus not yet practical for application in everyday sensing technologies. On the other hand, the robustness and versatility of mechanical resonators makes them excellent candidates for technical applications. “Our approach has been to extend techniques from ultracold atomic physics to microresonator-based sensors, and get the best of both worlds,” Vengalattore said.